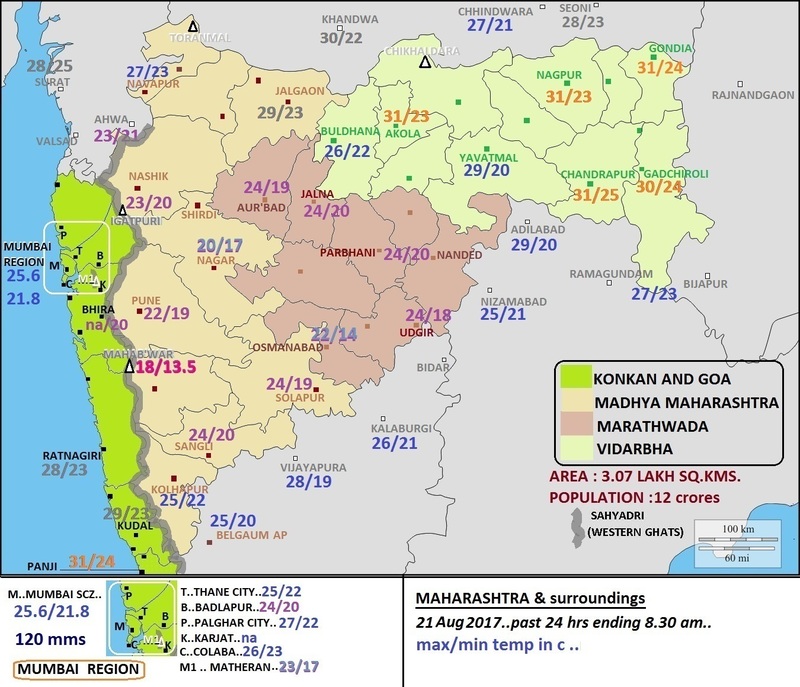 Because of clouding in the western quadrant of the low pressure BB-7, which was situated over Vidarbha yesterday, western Maharashtra was cold and rainy ..The low proved of ample help to the Marathwada region which received rains after 2 months .. Very nice presentation Rohit. And these are really very low temperatures for August. Many of them 10 year lows. Again GUJ seems to be in extreme spells... This implies no rains for south India... (TN will miss thunders). KER continuous to be deficit. 2013 sept GUJ rains are still fresh in mind..
PUNE crosses its normal rains! Rain over Gujarat has no relation with that over south India. TN will continue to get thundershowers. As Rohit mentioned, Chennai and Bangalore have got above normal rains and TN as a whole is above normal by 34%. In the coming days, it is going to rain over Kerala and Karnataka as well. So better to get the facts right and understand the correct nature of SWM rainfall. Amazing way to present the temperature and rainfall figures. Today here seems a sunny day since morning. Sir how weather looks for ganpati festival which starts this friday. Rajesh Sir - Is there any low pressure going to form in BOB?. The IMD Satellite pic suggest so?. Rajesh Sir, what are your estimates regarding the weather conditions of NW India for the early half of September?